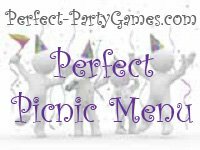 Summary: Perfect Picnic Menu is a game where you guess which menu matches which player. Print out one copy of the Picnic Menu Game Sheets for each player. Write in a different number at the bottom of each game sheet that lists the five categories of picnic foods where indicated on the bottom right side of the page. For instance, if you have 12 players, then print 12 of both game sheets but only write the number 1 on the first sheet in the bottom corner, the number 2 on the next sheet in the bottom corner and so on until all 12 of the sheets have a number. The other set of game sheets are to be used when guessing who's menu is being read outloud later in the game. Hand out only the numbered game sheets first. One to each player with a pen or pencil. Tell the players they must remember their own number from the bottom of the sheet but not let anyone else see their number. Have each player circle the most correct answer that matches their own taste buds in each of the five categories. Tell the players to keep their answers hidden while they complete the game sheet. Their favorite item might not be on the list, but they must still circle their next best choice. When all the players are done, collect the menus and pass out the second sheet, one to each player. Have one person read Menu #1 outloud. This is when the players will write down the name of the other player who they think matches that menu. Read each menu in turn until all menus have been read. The winner is the player who has correctly guessed whose menu belongs to whom.